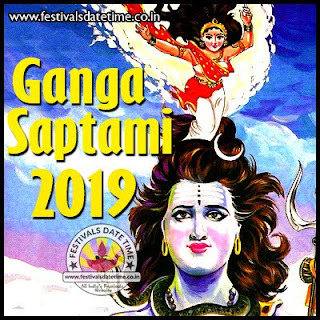 About Ganga Saptami : Ganga Saptami is a biggest Hindu festivals of Goddess Ganga. This festivals celebrated in the morthan states of India. In india Ganga Saptami also known as Ganga Puja or Ganga Jayanti. According to Hindu legends, Mother Ganga had reached form Lord Shiva's jaw and reborn of Mother Ganga. Ganga Saptami celebrated on Vaishakh Mass, Shukla Paksha. All over India people worship of Mother Ganga on Ganga Saptami.